This is the view from the parking lot looking generally west. Before the war, this was the town of Chorwon. The 3rd Infantry Division took Chorwon in 1951. Because they felt they may need to withdraw and since the town could then serve as shelter for the enemy, the town was destroyed. 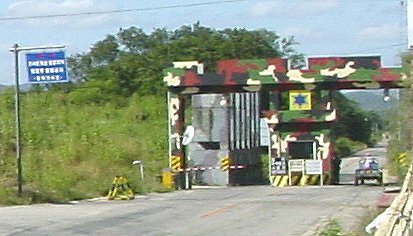 After the war, it was thought that the area was too close to the DMZ to rebuild. On the right, the road forks and you can see two ROK blocks and the anti-tank berm. Below are blowups of these. Please see the wartime view from the hill across the road. These devices would be used in the event of a North Korean invasion. Explosives would blow rubble into the road and along with the earthen berm hinder armored vehicles. The blue star is a ROK divisional symbol. Real and dummy fighting positions are placed in the DMZ area. The front lines would be lightly held in the event of an invasion with the intention of fighting a more mobile battle to the rear.